Capturing video footage with your digital video camera system is great, but there may be times when audio is also needed. In this case you will more than likely want to have some good surveillance camera microphones. Many of Security Camera King’s digital video security cameras come with an on-board surveillance camera microphone to record audio. Some of the more frequent applications of audio are using the camera at entrances and exits as a door guard, gate keeper, or other special applications. Two-way audio using the Internet or a network allows you to hear what is being said or done and react by being able to talk back where the subjects can hear you through the camera’s on-board speaker. Not all units have surveillance camera microphones for this purpose. However, Security Camera King does sell powered microphones specifically for this purpose. Our product# MIC is rugged yet produces studio quality sound and the microphone can be mounted almost anywhere. It has both the power plug receptacle and the BNC plug-in for the audio cable. The microphone is sturdy and small so as not to be obtrusive when it is installed along with a digital video camera. WARNING: There are state laws concerning the recording of conversations without all those participating in the conversation being aware of the recording. Check with your own state laws to make sure you are complying with state, federal, and/or local laws if you are covertly recording conversations and video images as well. Oddly enough, there doesn’t seem to be too many restrictions on video capture, but there are plenty that deal with audio recording. For many states where a surveillance camera microphone (with audio) is used, a simple notice or sign posted in the area of the camera is sufficient enough. (For example, “These premises are protected by digital video cameras with audio. Both video and audio is being recorded.) Other states may have more elaborate requirements to be compliant. Quite often you may wish to have a security camera audio hookup on one particular camera in your system: A baby monitor. Having audio for a baby monitor increases the ability to keep a safe watch on a child. It can alert you immediately if anything is wrong. 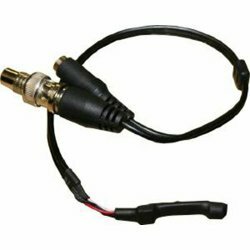 External microphones like product# MIC above are normally connected to the Digital Video Recorder or DVR by two wires with a BNC connector on the end. The standard power plug accepts from 6 to 12 VDC. Again, check the specifications of your camera as the camera may already have an on-board microphone/speaker. Sometimes it’s more advantageous to have a separate surveillance camera microphone even if one comes on-board with the camera. Chances are that if you are covertly recording video, you won’t want the camera mounted somewhere that will make it easily seen. The same situation for the microphone applies, however the camera may be mounted in such a remote or unusual place that you will want a separate surveillance camera microphone mounted closer to the origination of the sound. This could mean that the camera could be in one wall of the room and the microphone is installed somewhere quite distant from the camera such as the opposing wall or on the ceiling. If you are installing a new system or replacing an older DVR with a newer DVR and it is one of Security Camera King’s featured DVRs the DVR will be able to accept audio input and audio output. Even our entry level 4 Channel Elite-Mini Economy DVR has to Audio In ports and one Audio Out. However, other DVRS may not include the ability to support audio so it is best to check the specifications sheet for that DVR before purchasing. If you have any additional questions concerning surveillance camera microphone or security cameras or DVRs with audio, please contact any one of our security experts either via on-line “Live Chat” or by telephone at 866-573-8878 Monday through Friday from 9AM to 6 PM EST. we are looking for surveillance cameras with microphone. could you please tell us what you have of camera surveillance type ?